A giant snake with slow base movement speed. While moving along terrain Boa blends in with the surrounding, gaining stealth, extra movement speed and a greatly extended basic attack range which brings Boa to whatever she attacks. (the higher health, the more damage). While Boa has more than 60% health, Titanic Extent cripples enemies, slowing them. Boa has a special pit located near its eyes allowing it to detect enemy champions a short distance around it. 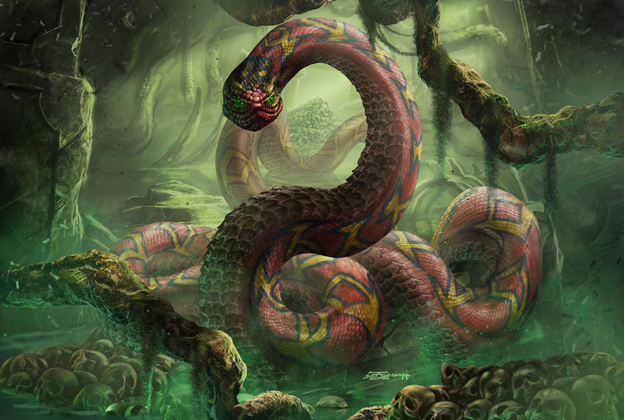 When an enemy champion enters Boas sensory pit range, Boa is alerted with a red sign from the direction of enemies. Boas next basic attack applies bleed and deals massive magic damage. While constricting, Boa rapidly uses up mana for each 0.5 second she holds her target for. The target is unable to move, use any spells or abilities and takes max health percent damage every 0.5 seconds. Using her other abilities ends constrict.